The Bainbridge Grange’s last big event was a meeting of the newly-formed fruit grower’s club. They tasted pears, talked about their gardens’ successes and failures, and strategized about how to get new members – typical stuff at the quiet little community hall on North Madison. But things weren’t always so tame. The Grange hosted some raucous teenage rock shows during the early part of the last decade, and even more back in the ’90s. But the island’s teenagers of the recent past have nothing on the crazy knife-wielding, window bashing kids of the 1960s. 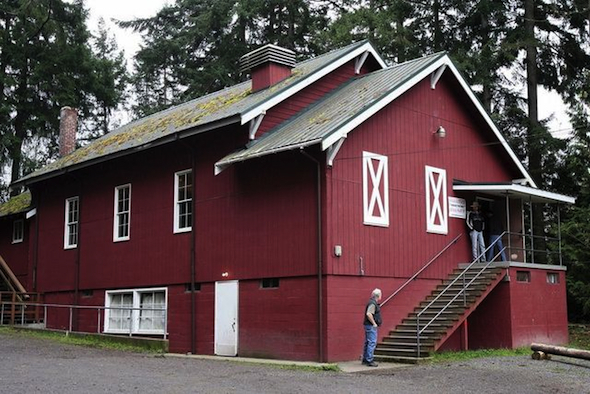 An orderly teenage dance became chaos Saturday night when a full-scale riot erupted at the Bainbridge Island Grange Hall. Two youths remained hospitalized today from the melee, and three others required treatment for stab wounds. Several others were injured but did not require treatment. Two youths are being held in the county jail as a result of the incident. At least 10 automobiles parked outside the hall near Rolling Bay had windows broken because of the fracas. For more about the Grange, read our 2010 story about its revival here. And check out Larry Steagall’s photo gallery here. When it comes to covering Bainbridge Island, I’ve joked with some of my colleagues that I should have cut back on all the journalism in college and spent more time studying law and hydrogeology. That’s because the big stories on Bainbridge often feature one or both of these topics, and having a better understanding of their complexities would have served me well during the eight years I’ve reported on the island. Well, now I get my chance. I’m shipping off to Boulder, Colo. to study those very things – plus a whole lot more – as a Ted Scripps Fellow in Environmental Journalism at the University of Colorado. It’s an opportunity I couldn’t pass up. The basic idea is the university throws its doors open and lets me and the other four fellows take whatever classes will make us better environmental reporters. I’m planning on studying environmental sciences, environmental law, and I may try and squeeze in some writing and photojournalism courses. I’ll also attend conferences, go on field trips, participate in fellowship seminars and work on a research project. With the other fellows hailing from the Los Angeles Times, Spokesman-Review and Associated Press New Delhi bureau, I can tell you that I’m still pinching myself that they let in a kid from the Kitsap Sun. Speaking of the Sun, the paper has been amazingly supportive every step of the way, and have pledged to take me back when the fellowship ends in May. I’m leaving the Bainbridge beat in the talented and highly-capable hands of Tad Sooter, whose byline has been appearing regularly in the Bainbridge Islander and Kitsap Sun. He’s worked for the Bainbridge Island Review, North Kitsap Herald and was the editor of the Kingston Community News. I’ve admired Tad’s work for years, and I’m glad the Sun’s readers will be seeing more of his stories and photos. You can read Sun editor David Nelson’s column about my departure and Tad’s new role here. 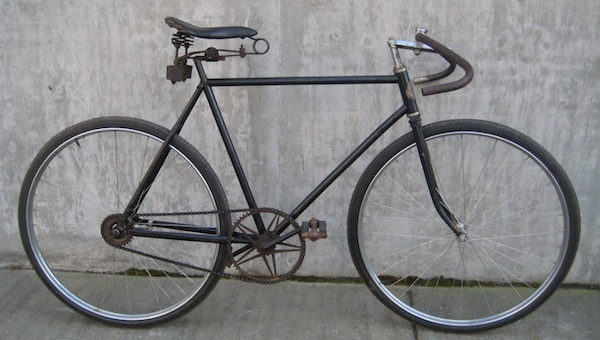 A pothole was the apparent cause of a bicycle wreck that sent a Seattle woman to the hospital Saturday. The cyclist was pedaling west on Hidden Cove Road when she rolled over the pothole and lost control. The woman was flown to Harborview for treatment of a head injury and abrasions. 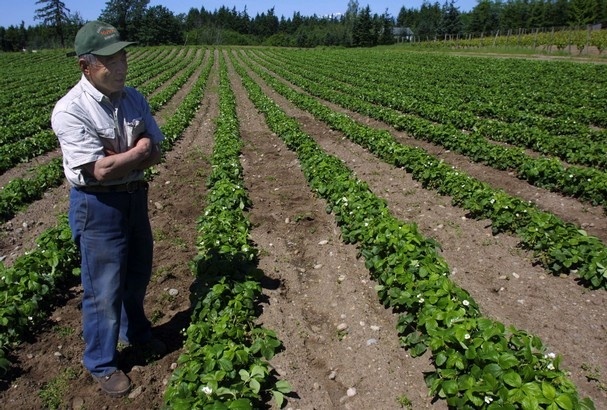 Longtime Bainbridge farmer Akio Suyematsu died this afternoon. He was 90 years old. His friend, Gerard Bentryn – who grew grapes next to Suyematsu’s Day Road berry fields – said Suyematsu passed away at a Seattle care facility surrounded by family. Bentryn and other island farmers credit Suyematsu for keeping farming alive on Bainbridge. You can read more about Suyematsu here. He was born on Bainbridge in 1921, when the island was one of the state’s largest producers of strawberries. He was sent to an internment camp with other Japanese Americans during World War II. Shortly after his release, he was drafted and then trained for the all-Japanese-American 442nd regiment, one of the most decorated in the history of the U.S. armed forces. The war ended when he was on furlough, and he was shipped off to Germany to serve as a military policeman. He returned to the island in the late 1940s and has farmed ever since. Most of the island’s full-time farmers credit Suyematsu’s generosity and practical know-how for making them the farmers they are today. Mostly, they say, he led by example, putting in long hours without much rest and no complaints. Bentryn said Suyematsu was in a great deal of pain shortly before he died. He was recovering from surgeries to treat problems with his heart and stomach. “Nobody wants to die, but he didn’t want pain,” Bentryn said. Bentryn expects a memorial service will be announced in the coming days. “Not having Akio… it’s a big change for us,” he said. POLL: Where does Bainbridge need the biggest cellphone boost? The Bainbridge City Council wants to tackle the island’s cellphone tower ordinance in the hopes it will lead to better coverage around the island. The ordinance hasn’t been updated in 15 years, making it outdated and overly restrictive, according to cellphone companies. If the rules are loosened, what area of the island would you most like to see get a coverage boost? Cast your vote in the poll over to the right. For the results on our last poll about the Ostling trial verdict, head down below. This week, a frustrated repo man was seen twice backing his truck into a woman. Apparently, the woman was blocking his truck from pursuing a vehicle he was tasked with repossessing. She suffered minor injuries. The body of a state Department of Natural Resources diver was found today after a three-day search off south Bainbridge. BAINBRIDGE ISLAND, July 27, 2012 – Bainbridge Island Police confirm that today at approximately 1:20 pm, the body of missing diver David Scheinost was recovered. On Tuesday afternoon, while working as a diver for the Department of Natural Resources, Scheinost failed to surface and presumably drowned off Bainbridge Island. The cause of the accident is still being investigated. Representatives from the Bainbridge Island Police, Kitsap County Sheriff’s Office, United States Navy, Coast Guard and volunteer divers searched for Scheinost for the past three days. A submersible, owned by Pierce County Sheriff’s Office, located the body of the 24-year-old Puyallup man while searching the area he was last seen diving. Pierce County marine officers will be assisting with the further evaluation of the accident. The family of Scheinost has been notified. “I believe I speak for all rescue personnel involved when I say we are all very saddened by this tragedy,” said Commander Sue Shultz. The Kitsap Cash Mob is planning a hit at a Winslow Way retailer this Saturday. Don’t worry, this mob plans to spend money (and lots of it) rather than extort it. The Kitsap Cash Mob is part of a national movement in which a group of shoppers come all at once and flood a locally-owned business with some much-needed revenue. 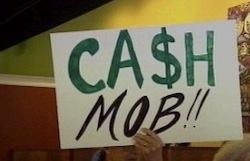 You can read my story about a Kitsap Cash Mob event in Kingston here. The mob has hit several places around the county, but this is their first one on Bainbridge. The target: Paper Products, a Winslow office, art and gift store that has seen more lucrative years. Here’s what Paper Products had to say on the cash mob’s Facebook event page. Anyone can join in on the hit. It starts at noon and ends at 3 p.m. Once the shopping’s done, the mob plans to gather at Lynwood Center’s Salmon Canyon Cafe for a post-hit meal. A drunken woman napping alongside a Winslow street was treated to a little kindness from a stranger this week. Police who were called to assist the sleeping woman found that an unknown passerby had tucked a pillow under the woman’s head. Also this week, a woman rearranged a man’s face with a mighty kick, a septic worker survived being run over by a tractor and a man informed police that he had been “choked to death” by his roommate.